A Private Branch Exchange hosted phone, using digital technology, that is connected to the internet and has numerous business features such as call waiting, routing, hold, and extension capability. A PBX phone system is normally used by companies to connect internal business lines with one another and to provide access to the PSTN (public switched telephone network), SIP (session initiation protocol) Trunks, and VoIP (voice over internet protocol) providers. 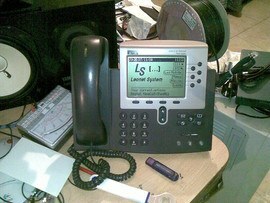 A PBX phone typically costs between $20 and $100 per user per month, depending on the desired features.